27th September 2013. Office closed this Monday for WA Long Weekend; Handheld Satellite Phones Article; Fight Track Closures; Win the Ultimate 4WD Valued at Over $97,000; Flinders Ranges Map and Outback Way Atlas & Guide. Technology and devices are continuing to change at a rapid rate, and no more so than with the area of satellite technology. We have just completed a major update (total rewrite) of our Satellite Phone article on ExplorOz. If you’re in the market for a satphone soon, you’ll find this essential reading. If you like the article, don’t forget to leave a review; if you have a question, leave a comment; and if you use social media, use the buttons to share it! WA is the only state to not observe the Queen’s birthday when it falls in June, because the previous weekend is already a fixture on the calendar for the WA Day long weekend. The Queen’s birthday long weekend is celebrated later in the year to avoid consecutive long weekends and typically falls on the weekend of the AFL grand final – the last weekend in September. 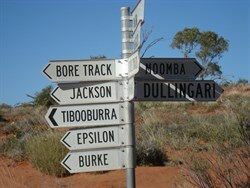 The admin staff of ExplorOz are in WA so we'll be closed on Monday. Please note that our warehouse in South Australia will still be open so order processing will not be affected. How Can We Fight Track Closures? It’s disappointing when we hear news that certain tracks have been closed. But it’s all the more concerning when its station owners closing popular access tracks that run through their properties, claiming it’s come as a result of driver neglect, and bad camp etiquette! The closure of the Bore Track, near Cameron Corner is one such example. The impact of such a track closure should ring alarm bells with each and every one of us. Not only should we take a moment to reflect upon our own driver attitudes and camp habits, but why not do your bit to help others understand how to minimise our impact when we travel. To help you share the correct information within your circle of influence, why not take a look through the On the Road section of ExplorOz Articles, such as Care for the Environment, & Travel Etiquette. These articles cover a huge range of issues, including track preservation, rubbish, toilets, fires, waterways, native animals, selecting a campsite, building (and extinguishing) a campfire, outdoor music, protocols for using gates and accessing station properties, permits, outback graffiti and vandalism, driving etiquette when towing, and tips for dealing with trucks on our roads. Use these articles to springboard discussions. Use the Comment/Review feedback buttons at the bottom of these articles – Comments will start new threads in the Forum, whilst Reviews will remain on the article page only (and a copy sent to the site administrators). If you use other Forums or Facebook, why not take these discussions and ideas into other online communities to encourage spreading the word. It's probably the people beyond the reach of ExplorOz that need to think about these issues before we can see a change, so help us reach them. Win the Ultimate 4WD Valued at Over $97,000! Ultimate 4WD Equipment stocks all of Australia's trusted 4WD brands at a great price. Proving that it is possible to avoid unreliable imported accessories they've created Australia’s BEST equipped 4x4, and it's up for grabs! Simply purchase over $1000 worth of partnered products to go in the draw to win a Hilux Dual Cab ute valued at $97,387. Entries close 10th November at 3.00pm, so if you're considering installing a bulbar, upgrading your tyres or adding a fuel tank, shop online at www.ultimate4wdequipment.com.au or go instore at 19 Catalano Rd, Canning Vale, WA. A waterproof map of the Flinders Ranges that is ideal for 4WD touring within the region. This map also includes inset national park maps of Flinders Ranges National Park and Vulkathunha-Gammon Ranges National Park. Visitor information for both the national parks, the Leigh Creek region and the Blinman region make trip planning and navigation simple, with accompanying tourist information including self-drive treks, historic sites, necessary contact details and listed national parks and reserves. Travel and enjoy Australia’s longest shortcut – from Perth to Cairns – with The Outback Way Atlas & Guide. This informative book, with its easy-to-follow maps throughout, is an indispensable companion whether you just want to make it across the Centre or are looking for a serious 4WD adventure. This 2nd edition features revised and updated text as well as completely revised and updated maps, with strip maps from the recently released 6th edition Great Desert Tracks Maps.